The room is located on garden level. You will be delighted with its classical and beautifully fresh decor. Measuring almost 80 ft2 (24 m2), it will be accommodating for 2 or even 3 people with a spare bed (or baby’s cot). 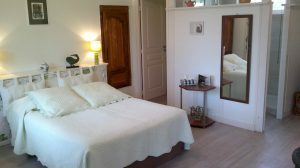 For a 2 person stay discovering Normandy, the Houlgate guest room awaits you! Houlgate was no more than a modest hamlet until the mid 19th century when it was bought by Parisian investors. In 1870, the grand hotel was built, followed by the villas and a church. Houlgate is home to one of the finest collections of 19th century villas (over 200) made of stone, brick and wood. Less “bling-bling” than its prestigious neighbours, Houlgate offers a peaceful, authentic atmosphere, and countless walks along its beaches or atop the Vaches Noirs (“Black Cow Cliffs”) where you can go back millions of years hunting for fossils. For a romantic break, a sight-seeing holiday, a walking, riding or golfing holiday, or a relaxing beach holiday, Houlgate is sure to meet all your expectations. Houlgate is located 20 mins away from the B&B Les Marronniers.